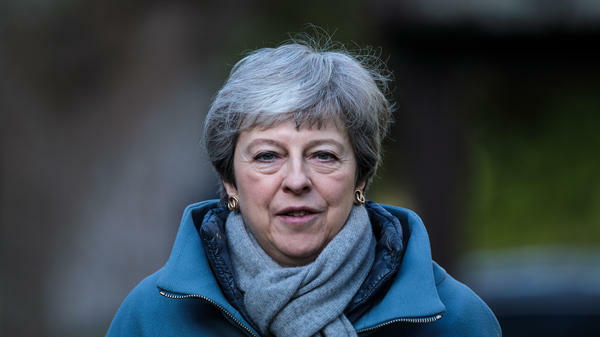 British Prime Minister Theresa May is reportedly facing pressure from within her Conservative Party to quit over her handling of the Brexit process. Here she attends a church service on Sunday in Aylesbury, England. The prime minister's office released a statement after the meeting, but provided no indication as to whether May had made any progress on gaining support for her plan. A Downing Street spokesperson did not address rumors about May's future. "The PM and a number of government ministers met today at Chequers for lengthy talks with senior colleagues about delivering Brexit," the spokesperson said, according to Reuters. "The meeting discussed a wide range of issues, including whether there is sufficient support in the Commons to bring back a meaningful vote this week." Despite the pressure she is facing to step down, May has survived two no-confidence votes in Parliament, the most recent being this January. She cannot face another leadership challenge from within her own party until December, according to party rules, but if several members of her cabinet resigned, she could be convinced to quit. May could present her Brexit plan for a third vote next week, but she has said she would do that only if she were certain it had enough support to win. If Parliament can agree on a plan next week, the United Kingdom will have until May 22 to leave the EU. But if Parliament can't get a deal done, it will have to devise a new plan or leave the EU with a no-deal Brexit on April 12, which most experts say would be a nightmare scenario.